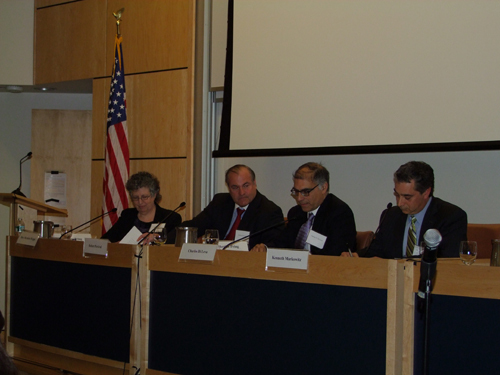 On April 1st, Pace Law School, in collaboration with the NY State Judicial Institute, the Environmental Law Institute, and the IUCN Commission on Environmental Law, hosted a working Symposium on environmental adjudication around the world, bringing together leading environmental justices and scholars. More than 380 jurisdictions in nations around the world have independently established environmental courts or tribunals, but often lack the resources needed to support these initiatives. To help promote the future success of these special courts and tribunals, the Symposium explored how to launch an autonomous international judicial institute that would facilitate the exchange of ideas, engage in capacity building for best judicial practices, and lend collective support for realizing the rule of law in environmental adjudication. In her introductory remarks, Julia Marton-Lefevre, Director-General of the IUCN, expressed how the IUCN will follow these efforts closely to better understand how states can contribute. She also emphasized the importance of capacity building and the rule of law agenda of the Symposium, given its timeliness to the Rio+20 Earth Summit in 2012. Keynote address speaker, the Honorable Antonio Herman Benjamin of Brazil, challenged courts to move beyond that of a spectator judiciary (an institutional “non-actor”). He emphasized the importance of upholding the principle of non-regression for maintaining the gains of forty-years of development. Illustrating how a well-established court system can effectively handle environmental adjudication, Justice Brian J. Preston described the Land and Environment Court of New South Wales, Australia, where he presides. In contrast, the Honorable Donald Kaniaru of Kenya described the challenges associated with creating a new Environmental Court, once again emphasizing the importance of the Symposium in setting the groundwork for the development of partnerships between countries that will continue through the Institute. A panel on the Rule of Law and Environmental Adjudication underscored the need to involve financial institutions to assess economic valuation with regard to environmental claims. A second panel discussion focusing on the developments and challenges with respect to environmental adjudication in China highlighted, once again, the need for capacity building and partnerships between nations in addressing the challenges unique to developing countries. Scott Fulton, General Counsel of the U.S. Environmental Protection Agency, summarized several themes to consider in establishing special environmental tribunals and facilitating their success worldwide, including the strengthening of environmental laws, institutional arrangements, and stakeholder participation and accountability. The Symposium was a huge success, drawing audiences from around the world through the live webcast. The recorded webcasts, Summary Report, and Briefing Paper may be accessed on our website.